Are Animals Digging For Grubs In Your Yard? Do I Need Grub Control? 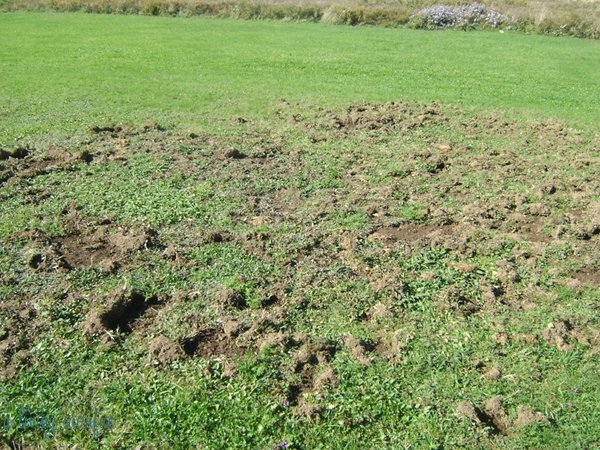 If you see that your lawn has been dug up by animals then you do need to get grub control. HOWEVER, THIS WILL NOT STOP ANIMALS FROM DIGGING! Unfortunately, these animals will eat the grubs whether they are dead or alive. So, trying to control the grubs will not help in this regard. The reason you want to control grubs is because when the grubs begin to feed on the lawn they can kill your entire lawn and you will surely be left with a very expensive repair job after. How Can I Deter The Animals From Digging? Cayenne Pepper: most animals that dig in your lawn have very sensitive noses so one home remedy is to apply cayenne pepper to the damaged areas. One sniff of this send them running over to your neighbors lawn. Soapy Water: even though animals don’t have good table manners they do have half decent taste buds. Which is why apparently soapy water IS NOT their sauce of choice. Try this simple solution: Mix some dish soap with water. Then apply it to the damaged area. This should offer a short term solution to the animals feeding in your yard. 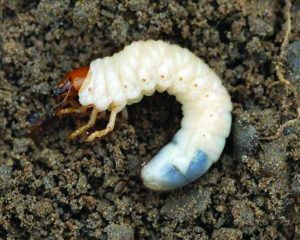 In most areas of North America, the best time to treat for grubs is in June. This is because June is when grubs start to feed on the lawn. The way the product works is that when it is applied to the lawn it gets taken up by the grass and it works when the grubs feed on the grass. Traditional grub control products such as Merit will last the rest of the year if applied in June. If you are living in an area such as Ontario, Canada where the only product available is nematodes then you should apply them in late August/early September when the grubs go for their second cycle of feeding. The best way to repair the damage is to over-seed the lawn. This can be done with aeration or by applying top soil to the dug up spots, levelling it nicely, and applying grass seed over top. Want to learn more about lawn care? Read our seeding tips or check out our list of 20 items you should have for DIY lawn care.